“Four days down, one to go”. This is what everybody says around us this morning, but it is not the way I see it. The right catchphrase should be: “Back to the drawing board” or “Today, it’s all or nothing”. I guess that it’s my 15 years of triathlon experience that tells me that even if you have been awesome for 95% of a race, it means nothing if you end up walking or quit before the finish line. So there is tension in the air this morning when I wake up. For all, there is a lot to lose today, there’s expectation, there’s attachment to a success that as not occurred yet, there’s fear, fear of losing, fear of failing, so close to the end. I guess my recent increase in meditation activities helps me stay grounded. I remain in the present moment, focused on my preparation. Plastic Free Seas’ founder, Tracey, even asks me after observing me for a bit: “Are you always so calm before big events?”. Nobody sees it but I am in fact going through a tough time, but it’s all physical. I woke up with nausea and feeling bloated. That bugs me a bit. The weather is more humid than before and I need fresh air. I’m really not feeling well. So I decide to climb to the deck where our kayakers of the day are taking their breakfast. They are good friends of mine and with them and my wife who arrived in the morning, I am in very good company. She will spend the day watching me from the speedboat, taking pictures and getting her share of this foolish adventure. Finally, with the fresh air, my body gets back to normal. I even feel a rush of enthusiasm and force myself to contain it. Bursts of energy, be they destructive or positive, should be channeled and used to reach the goal, and for nothing else. Still, there is a worrying question mark that I am trying to contain: will my left shoulder hold well today ? 10 am start. We’ll know soon. A dive into the ocean, as if I was racing a 100m, showing off a bit, it helps relax to act as a goofball sometimes. As soon as I hit the water, I know that this is going to be the day I wanted, hard, very hard, but all the more so rewarding. I always time our nutrition very strictly, every 25′. We have a loop in Discovery Bay where we trained for a couple of months that is approx 1.5k and we have taught our body to stop and refuel at the end of it, i.e. after 25′. It helps to have a framework in the middle of nowhere, and when we get tired we start to really look forward to this pause. At the first stop I realise that my shoulder pain is absent and… that we are progressing very slowly. 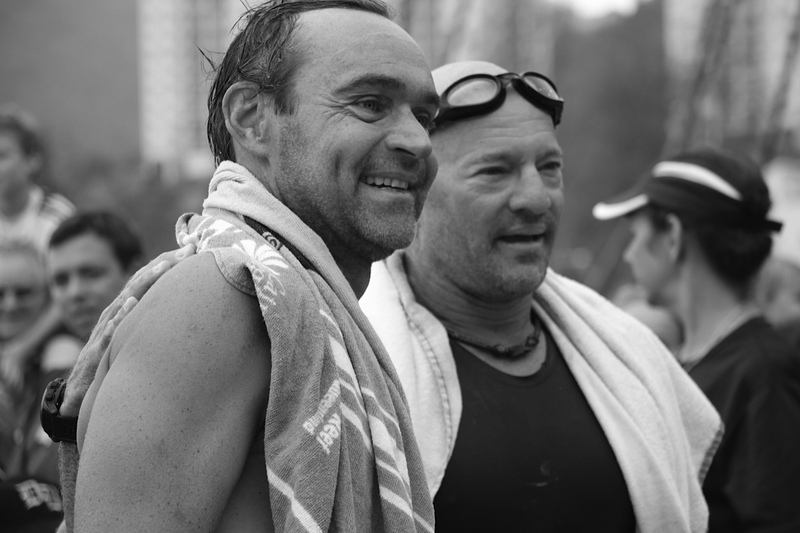 2’06/100m, that’s more than 20″ slower than in training: we are swimming against the current. The entire first bay we have to cross is spent swimming like this. It feels as if I was swimming with paddles and drag short: hard work, strength work. I love this kind of swimming, so much more than pool swimming. You really have to ‘pull’ your body ‘up’. It’s as if you have to climb a wall just using your arms, in the last bit, when you engage your triceps and back muscle to raise your body above the wall. This kind of conditions consume a lot of energy though and we are both looking forward to reaching the next marker, where we will change direction and get different conditions, which we hope will be better. It can only be better, right ? At the end of the bay, we have a dream vision: Discovery Bay buildings ! Great ! but so, so far away. It seems to me that it’s 10k away from us, but it can’t be, as today is supposed to be a 12k short dip. Our GPS watches have shown that we have swum an average of almost 16k a day, therefore the last day is expected to be shorter. But since the beginning I have not attached much importance on distance figures. First, we are not 100% sure of the 75k distance. Second, we modified the course a bit, by passing through Tung Chung, which was not the original plan. Third, while GPS watch technology for swimming has made huge progress, it is still not 100% accurate. As a proof, there are some days when we swam side by side the entire day and our watches showed 200 to 300m differences. So to me, today is just another long day, we’ll see what destiny throws at us, it may be good, it may be bad, it may be short (sort of! ), it may be long, and we have to accept and make do with it, do our best, there is no other way. With DB in sight, we also get a rather horrific vision: the sea in front of us is beaten by the wind, with waves and white crests in all directions, a battlefield we will have to cross. Suddenly, coming from nowhere I see Merry, my outrigger canoe support from day 1 and day 2, who comes from DB to support us, unexpectedly. She explains to me that a typhoon is not far and that the conditions are really tough. She also explained that coming from DB was super fast, as the wind blew into her back, which means that we will have a face wind. At this stage, around 1h30 into the swim, my mind has settled down for a while already and I take the news rather peacefully. My shoulder is fine, my thoughts and emotions are under control, I have followed my nutrition plan religiously, I can feel that my energy reserves are still very high, and these are the tough conditions I wanted. Yes, I wanted tough conditions for the last day. Yesterday was hell because of my shoulder pain, but the conditions were ‘easy’, with nice current in favour. Today is our last day, I wanted it to be the day of the warrior, to keep with me found memories of overcoming my limits. So here it is, the moment of truth. Today is for me, this is my day and I’m ready for it. What I didn’t expect is to get separated from Bruce. I wanted to go into the battle with him next to me. Unfortunately, his kayak support drifted away and we got separated. Again, nothing I can do apart from accepting our fate. Bruce is a big boy, a very big boy, he’ll manage, as for me, well, we’ll see. The first kilometers feel great, the waves are just the way I like them, still manageable, in my way and all over the place, but not destroying my stroke. I even exchange a few jokes with my buddy and kayak support Sylvain. Bruce unfortunately does not get any closer. I know he tends to take longer stops. More worrying, he usually does not keep good track of the famous 25′ refuel window, and we lost our synchronisation. I am swimming when he stops and vice versa, so it is getting impossible to estimate if we are going at the same pace. I pass Mui Wo after a loooong stretch. My reservoir of strength has severely diminished, but I still have a lot. My mind wants to jump to the finish line, I heard they will be a drone filming us -how cool is that ?- I also heard that some of our friends will swim the last 2k with us, etc etc. Shut up mind, stay in the moment, so many things can happen still. And indeed, many things are happening. I heard that Bruce has decided to put on his wetsuit, as he is freezing. I am told to wait for him. So here I wait, but I get cold myself. Finally, I decide to resume swimming. I have lost sensitivity of the tips of my fingers. Damn it, I think, I must get warmer, right now! Thanks God the water is not cold (to my standards) and I’m fine again. I decide that I will wait for Bruce closer to the finish, and Sylvain has found me a nice place. Approx 2k before the finish, I get out of the water and here comes a superb yacht offering me hot coffee. I learnt after the event that this was all prepared, but unaware of the backyard manoeuvre, I remained speechless. Finally Bruce arrives, and we hugged as war survivors. We know we have made it at this stage. We still have to muster our energy and get going. Several friends from DB come swimming, on outrigger canoes or by boat, to accompany us. I can finally let my positive energy flow out, and I ‘jump’ like a dolphin, ecstatic, amazed by how all this turns out. Amazing also by how strong I feel, 16k into the battle. Bruce is marked, his stroke has deteriorated and he stops often to refuel, but he is making it. The last 200m meters, we’re on our own again, as our friends had decided to let us soak in the atmosphere, just the two of us. I do some water polo swim, head up. Upon us is the drone. Facing is the crowd, applauding. Over 17k, approx 4h40 of swimming, our longest day. Bruce gets up first, I follow, and we walk out, holding our hand in the air. That’s it, we did it ! BUT BLUE ODYSSEY BLOG DOES NOT FINISH THERE, THIS IS JUST THE BEGINNING !!! STAY TUNE !